A few weeks ago, it was my birthday. It is fun to see the nice things people can do for you. Modern technology has made it very easy to reach out to people. My wife sent me a very nice Facebook message with a picture of me. I thought is was very sweet of her. Many people liked her comments. One of the lunch ladies at my school saw the post, then replied with her own message that read, “Happy Birthday and beware today! When I left to go to work I was surprised with two pieces of cake from my wife on the front seat of my car to take to work with another sweet note. She is so thoughtful. By the time I got to work I went from having a great day to a spectacular one. When it was time for lunch to start the lunch lady made me a poster that said “Happy Birthday Mr. Fish with balloons. When each grade level was lined up waiting to get their food she said “make sure you say happy birthday to Mr. 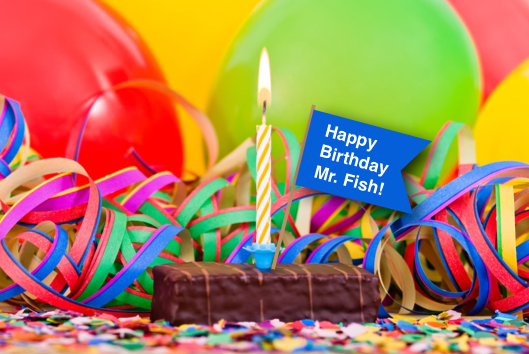 Fish today.” So out of 730 students at the school I think I heard Happy Birthday 900 times. When the fourth grade students came into the lunchroom they spontaneously started singing “Happy Birthday,” I was touched. It was very fun talking, and interacting with students. I got to thinking about this experience when I realized how important it is to treat people how you want to be treated. Some of the students I talked to have never talked to me before, and several students wanted to give me a hug. Many years ago I decided to always give students respect even when you don’t feel they are respecting you. This simple act of kindness has paid off many times over. I love the students, and I know they love me.